In short: A comfortable, agile and technology-packed SUV. 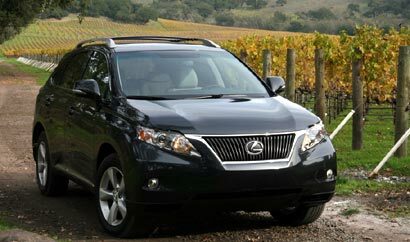 While the RX 350 is a sport utility vehicle, it is more refined than your basic SUV. It is purely and completely a Lexus, with all of the quality build, fit, finish and profound isolation from the outside world that have been the hallmark of every vehicle to bear that bright, decreasing radius corner in an oval. We know it’s an ‘L’, but the entertainment dynamics of a Lexus have always been far beyond what most of its owners will ever want. 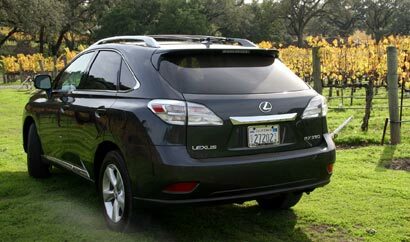 Once again, Lexus has engineered real effectiveness into the RX 350’s chassis, and not for the racetracks but for that moment when you see a freeway traffic nightmare with little warning and require an immediate, radical response. There is nothing like straightening the wheel and realizing you didn’t touch anything, that the vehicle moved like it read your mind. The RX 350’s ability to do this comes from its Active Torque Control system and four-wheel independent suspension. The SUV also features four-wheel disc brakes that include a slew of acronymic features: ABS, TRAC, VSC, EBD, HAC and VDIM. The Lexus-ness of the RX 350’s interior is notable in its attention to detail and logically effortless function. This is apparent with the Remote-Touch, a single manipulator for accessing information on the system screen. Within a few seconds, you realize that the control operates a cursor on the screen and the knob is simply an attached mouse. Along with the RX 350, the hybrid RX 400h will also be available. In spite of falling gas prices, the automaker tells us that the hybrid edition represented about twenty percent of RX sales for 2008. In whatever RX series or option package you choose, you will enjoy the quality surroundings, effortless function and much-admired character of a Lexus. Warranty/Service: Four-year/50,000-mile basic warranty; 10,000-mile free maintenance; six-year/70,000-mile drivetrain warranty; four-year/unlimited-mile roadside assistance; six-year/unlimited-mile rust warranty.